Instant Haiku Generator - Chose words from ten drop down boxes to write your instant Haiku. J. K. Rowling and her Harry Potter celebrate birthdays - participate in a debate and decide whether the books should be banned from the public library. Letter Poem Creator: Student Interactive - Letter poems are a particularly apt medium for exploring a defining characteristic of poetry-line breaks. As students work to transform narrative-style letters (shown at left) into poetic format, they are encouraged to think carefully about where to end each line. 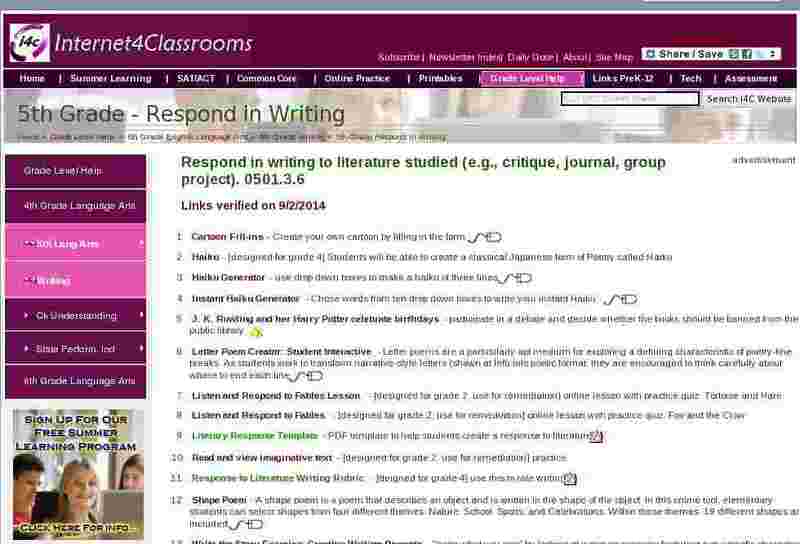 Literary Response Template - PDF template to help students create a response to literature. Response to Literature Writing Rubric - [deigned for grade 4] use this to rate writing. Shape Poem - A shape poem is a poem that describes an object and is written in the shape of the object. In this online tool, elementary students can select shapes from four different themes: Nature, School, Sports, and Celebrations. Within these themes, 19 different shapes are included. Write the Story Exercise: Creative Writing Prompts - "write what you see" by looking at a picture scenario featuring non-specific characters doing - whatever it is that you see!